The world of device management used to be comfortably divided in two: tools such as Microsoft System Center Configuration Manager* for PCs and solutions such as AirWatch Enterprise Mobility Management* for smartphones and tablets. Such neat divisions no ...longer work—tablets can increasingly run as full PCs, and energy-saving innovations in 4th generation Intel® Core™ processors and Intel® Atom™ processors increase device battery life and make PCs more attractive as mobile devices. Other new form factors, such as Ultrabook™ devices and 2 in 1 devices, can make PCs function much more easily in a mobile context as well. Traditional, domain-centered management tools such as Microsoft System Center Configuration Manager may not be effective for highly mobile Windows devices. Fortunately, new features in Windows 8.1 and Windows Server 2012 R2* simplify managing devices that are running the updated operating system through enterprise mobility management tools. And third-party enterprise mobility management solutions such as AirWatch build upon this functionality and extend beyond what is natively available through Windows. 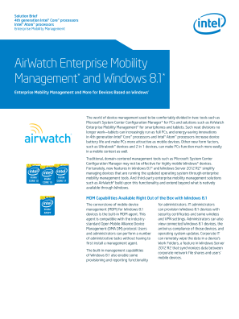 Read the full AirWatch Enterprise Mobility Management* and Windows* 8.1 Solution Brief. Analyst Csilla Zsigri, 451 Research, discusses trends in cloud services and how CSPs can succeed by understanding customers. Efficient and innovative cloud service providers will be the most successful. Find out how to secure your share of growth.